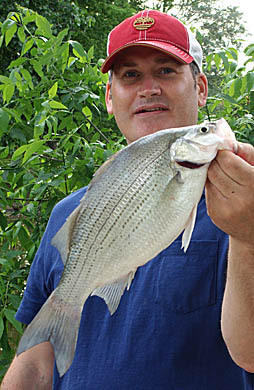 I had no complaints about the White Bass Run this year. It seems that in recent years I either couldn’t make it out, or if I could the conditions weren’t right. This year, I had multiple trips during the run that good numbers were caught with tons of bonus catches. The final trip to the Sandusky River before the end of the run, proved to be the best day yet. I was joined by my friend, Leo, who made the fortunate decision to make the trip with me. After a slow start, the fish turned on and we were catching them at will. We only ended the trip when it was starting to get dark and the mosquitoes were getting unbearable. I have no idea what the fish count was by the end of the night, but it was a lot, and many different species. The highlight for me, was finally getting a “Fish Ohio Award” sized White Bass that just reached the necessary 16 inch mark.